Putu mayam is a sweet dish served with grated coconut and jaggery, or, preferably, gur (date palm sugar). In some areas, gula melaka (coconut palm sugar) is the favourite sweetener. Putu piring is a Malaysian version of putu mayam in which the rice flour dough is used to form a small cake around a filling of coconut and gur or jaggery. 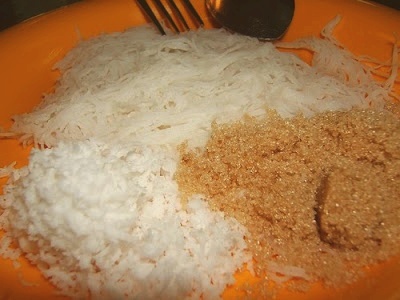 Mix the grated coconut with salt and set aside. Divide the rice vermicelli into individual serving plates. Top with grated coconut and sugar and serve.